Wedding cakes play a major role in the wedding party. In fact, some brides actually plan their entire weddings around the style of their cake. While traditional white, tiered cakes topped with the bride-and-groom figures are still predominant, colorful cakes depicting kooky themes and personally-significant tableaux have taken a strong hold on our pop cultural psyche. They are the subjects of reality shows like TLC's Cake Boss and Food Network's Ace of Cakes. Which style of cake should you choose? What should it taste like? After all, you want that special day to last in the sensory memories of both sight and taste. With this guide you can make your wedding cake both a visual wonder and a culinary delight! The wedding cake style will relate to your choice for the type of wedding you are having and the overall tone you are taking, whether formal, informal, contemporary, traditional, indoor or outdoor. When you have set the style, you can make all of this information available to your cake designer and provide him or her with a photo or idea of the decor with colors and materials, themes and motifs. Themed wedding cakes may not only reflect the reception but may be based on your honeymoon location. For instance, the wedding cake topper might include a Hawaiian motif as a palm tree on a sand bar, or a couple surfing or mountain climbing. In that manner, the typical bride-and-groom on top can be changed with a subtle bit of humor on an otherwise traditional tiered wedding cake by replacing the topper with Kermit and Miss Piggy, or any of your playful alter-egos. You may want to tie into the architectural theme of the reception space and have Art Deco styling with zig-zags, or Classical columns and arches, or Contemporary simplicity with rectangles, angles and folds that mimic a Frank Gehry-music hall. If you and your fiance (or fiancee) are both musicians, you may want to share your love of music by inviting your guests to nibble on a Baby Grand confection or a Rock-and-Roll guitar. Marrying a Swede? Perhaps you want to eat the country, symbolically that is, in a blue-and-yellow flag-designed sheet cake outlining the country's geographical shape. Did you and your spouse-to-be meet through the Star Trek convention or you share a love of Halloween? So you see how the ideas grow and how wedding cake themes are endless, personal and precious to each couple and their circle of friends and family. Traditional wedding cakes are the circular tiered type but these can be up-dated as a chic stack of diminishing squares. Another up-dating trend is embellishing tiered cakes with asymmetrical, cascading arrangements of vibrant, colorful fresh flowers. Cake Boss' floral wedding cakes are leaders in this trend. Your baker needs to coordinate with your florist to mix and match the right blooms. Another addition is placing wide ribbons around the base of each tier of the cake. Grosgrain or satin ribbon is typical or the baker can create faux ribbons from the frosting. Mimicking a pattern or a motif from the bridal gown is another great trend which helps to coordinate the wedding as a whole. The cake designer might duplicate in frosting the gown's lace or embroidery pattern, or copy the bride's unique necklace. For a more playful look, he or she may simply put some jewelry on the cake, like crystals or faux pearls to mirror the bride's jewelry. Meanwhile, the traditional wedding cake is still abundant with frosting flowers, swags and swirls. Who doesn't recall a richly frosted piece of wedding cake that was simply scrumptious? Even though your choice of cake and frosting can't please everybody, you can make sure your choices are your partner's as well, then do your best to choose a crowd pleaser! White or Yellow Cake. The most traditional wedding cake flavor is white or yellow cake. To take it up a notch, you can add filling between layers, and here you have a variety of choices, such as custard, milk chocolate, butter-cream, raspberry, strawberry jam and apricot preserves. Chocolate Cake. Many wedding guests love chocolate cake and brides are finally serving it more often, even though it may be concealed under traditional white frosting. Better yet, many brides are going for the "double-double" decadent treat--chocolate cake, chocolate filling, chocolate frosting and chocolate ornament! Marble Cake. A marble cake can be your answer to try to please all, and each cut piece can make a beautiful display on its plate. Another method for people pleasing is to alternate layers or tiers with chocolate cake and white cake. Lemon Cake. For variety, a refreshing lemon cake may fit with your overall wedding style, especially as you may have the color of lemons as a part of your color scheme. Yellow can be more appropriate for a spring or summer wedding. Carrot Cake. A fall or winter wedding can be the opportunity for a carrot cake. Keep in mind that the traditional cream cheese frosting found on carrot cake is going to be cream colored rather than pure white. Fruit Cake. 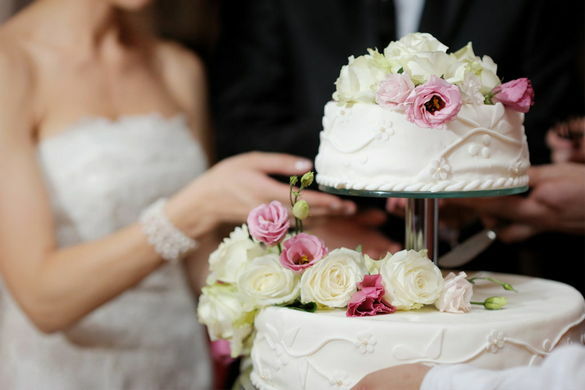 In the United Kingdom, the traditional wedding cake is a rich fruitcake. It was the cake of choice for the 2011 wedding of Prince William and Kate. It is not a dense cake, but the traditional English version is, nonetheless, packed with dried fruits and chopped nuts and brushed with brandy. It is usually topped with Royal Icing which seals in the freshness of the cake. Royal Icing. Due to the smooth and beautiful look of Royal Icing, it is often used for decorative wedding cakes and to create delicate decorations on the cake, such as a monogram. As it does not have as pleasant a taste as marzipan or traditional soft icings, it is not recommended for icing cakes, unless cake stands are used. This is because after Royal Icing dries and hardens, it tends to crack easily. Fondant. This is rolled into thin sheets and placed on cakes for a very smooth finish. Fondant makes an excellent base for decorations, and is chosen more for looks than flavor so you may want a more delicious layer of frosting underneath it. Marzipan. An almond paste, Marzipan is also rolled into thin sheets and glazed for icing cakes, primarily wedding cakes. This use is particularly common in England, on large fruitcakes. Persipan is a similar, yet less expensive product, in which the almonds are replaced by apricot or peach kernels. There are German, French and Spanish variations of Marzipan. Depending on the size of your reception, wedding cakes can cost hundreds into thousands of dollars. One way to have a show-stopper on a limited budget is to order a smaller tiered cake for display and cutting, while you have a sheet cake in the kitchen where it can be sliced and then served. A spunky alternative is to have a cupcake wedding. Displayed on a tiered stand, cupcakes can be offered in multiple flavors with a variety of decorations. Of course, a small, tiered cake can be on display and cut in ceremony. So, don't let your budget limit the role your wedding cake can play in your wedding. It will be unique to your special day. Whether traditional or themed, your wedding cake will have a wondrous look and a scrumptious taste that will be a memory for a lifetime.